"All the theories collapse when you can't see the stars in outer space." And there has been no proof since the beginning of manned space flight that the Sun can be seen from outer space. On the ISS there is the SOLAR/SOLSPEC device that looks out at at the Sun, but the Sun position sensor it uses is not an optical device. 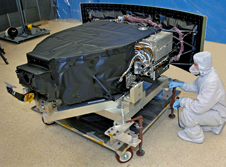 There is the $2 billion AMS device looking for Dark Fairy Dust that looks out into deep space. But a regular camera or telescope looking out into deep space? Or a porthole to see deep space from? Nope. Over the winter I worked my way through hours of video of EVAs from the ISS, the most boring video you will ever see. The EVAs are so tightly coreographed that the astronauts don't once get a chance to look at the Moon or stars, and in all those hours of video, the Moon or stars are not mentioned once, even though there should have been many opportunities to see them when on the dark side of the Earth. Moonlight, which should be as bright or brighter than when viewed from Earth is never mentioned, though it at times should have provided ample illumination to see by. All the evidence leads to the conclusion that the Sun or Moon or stars can not be seen from space, especially when outside of the Earths extended atmosphere, and NASA will not even consider performing the simplest of experiments to prove that they are visible, yet nobody questions this fact. The theories are all nonsense, and the 'facts' about all the 'stars' they think they see out there are also nonsense. 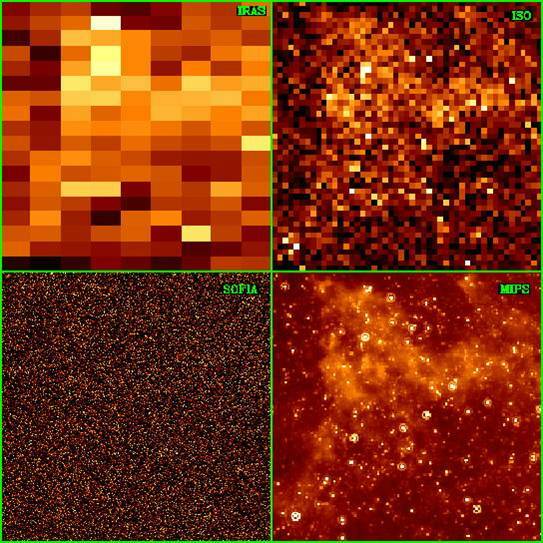 If the images from SOFIA were available it would be found that the millions of objects observed at certain IR wavelengths, and are assumed to be stars, actually show a shape, and not just a point of light. The one image I did see, and that quite clearly showed a few objects exhibiting distinct shapes, has been taken down, and I can not find it, or any other similar images anywhere. The only true Suns out there are at the center of what we are told are galaxies, or perhaps at the center of globular clusters too, but most of what they detect with their instruments is the Lyman line of neutral hydrogen, which surrounds all planets and moons too, and will therefore appear to be bright, and be assumed to be stars. but this site says that the SOFIA sky image is a 'simulation' (data with a lot of processing), and much of what is seen is noise from a warm telescope. I find that confusing, but it seems IR imaging is subject to confusion. The term "confusion-limited" refers to images in which there are so many detected sources that distinguishing individual objects is difficult. In a confusion-limited image, the spatial structure of the background resembles the superposition of many point sources. In the optical, the confusion limit is not often encountered, but can be reached in dense star clusters (e.g., in the image shown below). At near-infrared wavelengths, the background is usually dominated by emission from partially-resolved and unresolved stars or distant galaxies. In the mid- and far-IR, the background can also contain a contribution from Galactic "cirrus" emission. In an image that is near or at the confusion limit, determining whether a particular faint source is part of the background or is a target can be difficult. So what are we seeing with these images? No doubt the mathemagicians can create some nice images from the data, but are they anywhere near correct? Just show me a photo of the Sun or Moon from space, NASA, without using Earths atmosphere. Can't be done, and your theories should all collapse. The stars are there and the astronauts can see them if they look away from the sun. Well I can't find any footage where they mention stars, or the Moon. So take a longer exposure. If the exposure was longer, the film would absorb to many photons from the astronauts and they would become 'washed out' and appear as a featureless form of white, the opposite of the underexposed 'shadow'. What does it matter if there is one photo with a washed out astronaut? I want to see the stars. A washed out Moon, showing stars. Must be atmospherics diffusing the moonlight, but that wouldn't happen in space. An astronaut might be washed out, but the outline should be razor sharp. Another one: Moon and the Plae1ades. ..the technical detail are; 2 second exposure at f 3.5, ISO 64 and 48 mm focal length. But basically I use low ISO and long exposures, to keep the noise down. I just set the aperture as wide as possible and the ISO as low as possible and then look though the LCD eyepiece and and adjust the exposure time until I think it looks good. NASA doesn't know much about photography it would seem. Or they know a lot, and are just avoiding the subject? Or maybe the technical hurdles for stabilising a camera for a couple of seconds are beyond NASA. Nowhere to stand a tripod, so we can't take a long exposure? Sarcy bugger aren't I? Surely the astronauts remark on the view of space in the audio-logs ? I've looked through a lot of transcripts of crew conversations, and occasionally there is mention of some of the brighter stars, but those were mainly while in Earth orbit. The transcripts for the Moon missions do not cover the transorbital coast, which is when it would have been interesting to know what they were up to. I did learn some interesting stuff about the navigation systems they used, and the 'power optics' of the sextant. It did some funky coronaing until it settled down, meaning it was likely a vidicon type device, which is why all the ice particles from a waste dump made it seem like million of stars were visible. They would have been totally lost without the 3 axis inertial guidance computer. an 'amazing device', accordint to Lovell. In a video from Apollo 8 approaching the Moon, one of the astronauts comments about how the Moon appeared to be "a dark and uninviting" place, but in the transcript, 'dark' is omitted, and much of the transcripts is patchy and difficult to follow. But no astronauts ever exclaimed on just how awesome the view of the stars was, or the grandeur of the Milky Way. That's a treat only available from Earth. As for what the astronauts have said, well, they are all over the map. one said they are 10 times brighter, some said they could barely see any stars , some say they didn't see stars at all. This may be true, as it depends on where they were and which way they were looking. But 10 times brighter? The view of the heavens: the stars are brighter and you see the entire celestial sphere. On an EVA, your helmet is fairly panoramic. But if you don't think about having these experiences they won't happen to you. I forget who, but another astronaut said "You see what you expect to see", or something very similar. Those cosmic rays must do a real number on the old noggin. Chris Hadfield was recently asked by a school pupil about seeing the stars from the ISS. Tonight's Finale: People ask to see stars - my camera does its best in dim light. Our atmosphere glows in the dark. Another shot through the atmosphere, which is all he can do if there are no portholes looking out into deep space. He is due to make an EVA sometime this year, so I'd like to ask him to take a photo looking out from Earth, but it seems the only way to reach him is through the Facebook blog, and I don't do FB. If anyone else would like to try and get a comment from him, please do. The real test is so simple and quick that it is rediculous that it has not been done by now. NASA likes to take lots of photos of everything they do, except for looking at the stars. Or the Moon. Oh, and the Sun, but they never have a neutral density filter handy, so I guess that is out. And if this is the view form an old Nikon at 47,000 feet, why is there no shot like this from the ISS, with their newer hot-rod cameras? most of the sensors detect in visible light as well as other freq. so, I don't see why stars can not be seen from either craft. Er, Hubbles camera is just a bit more sophisticated than the Nikons they have on the ISS. A Nikon out where Hubble is would see nothing, just as it can't from the ISS, without using Earths atmosphere. 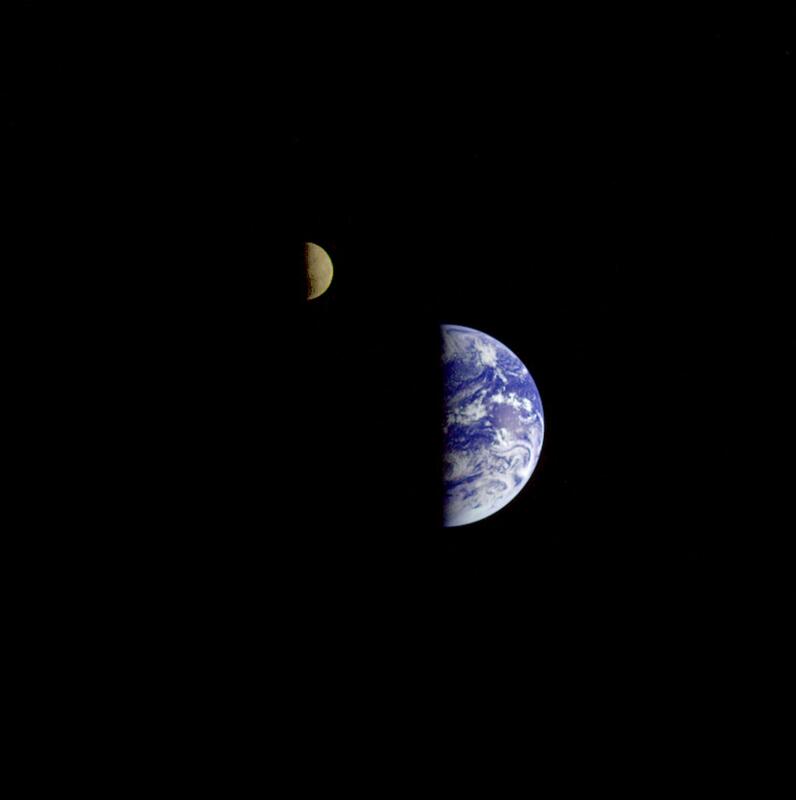 A 1992 image from Galileo, with the Moon and Earth. The Moon is between Galileo and Earth making it seem quite large, but what about the colour? The image is computer enhanced , but why brown instead of white, the way it looks from Earth? Gary, If nasa won't cooperate, maybe the russians would? Maybe contact one of the moon mission cosmonauts? If nasa won't cooperate, maybe the russians would? Language is a great barrier. (Babylon) How many Russian members are on TB? I'm sure there is a great deal of information that the Russians possess, especially in plasma and electromagnetism areas, that would be very interesting to TB members, it's just not that easy. On the ISS, the Russian module had 2 sleeping pods, each with a porthole looking, apparently, out into space, but I have never heard any mention of the view of the stars from them, or Sunlight or Moonlight streaming in through them. It's just black out there, to our eyes and cameras anyway. Maybe contact one of the moon mission cosmonauts? Most of them have dropped out of sight, and the others have such different stories, who do you believe? No, the answers are very simple, but NASA (or the Russians) will not go there. A video of the Moon, or an image of the Sun, at ISS 'high noon', and compare them with images taken with the same equipment and settings from Earth. Explain, if present, any differences. Lately, I have been e-mailing everyone I can think of who might be able to answer another (should be) simple question. Would the BIPH(Binocular Photon Machine) night vision binoculars work in space? I have had zero replies from NASA, ESA, Royal Astronomical Society, the manufacturer, The Bad Astronomer (now at Slate), Miles Mathis (the photon 'expert'), the CBC Canada science show Quirks and Quarks, (must add Bill Nye, the science guy), James McCanney (he's been bumbling through how light works and why we can see comets, lately, what a lot of nonsense) or replies to postings on numerous science forums, where not one person has expressed so much as an opinion as to if the BIPH device would work in space. And if it doesn't, which I'm pretty sure of, why not? I'd bet that if the BIPH did work in space, they would have been using one, and there would be a banner or something on the BIPH website pronouncing "As used by NASA!". Well, I tried an E-Mail to the Canadian RAS and got an instant reply! No answer about if the BIPH would work in space, or an opinion, but he did point me to info on an eyepiece for telescopes that gives the same results. Even better images due to improved technology, but only available within the USA as they are still classified. So what can the Top Secret devices do?? There is a description of the technology, and a link to some Messier Object images at the site. This looks very interesting. A crowd sourced, publicly accessible orbiting telescope. According to my theories, this should not work if they are just using regular optics as in a consumer camera. If it does fly, and it does work, then either my whole theory is blown, or the optics are something special. There is no detail on the optics, and it could be that they will use technology developed for the Star Tracker cameras. The Star Trackers have been drastically reduced in size and cost, and the key seems to be the manufacture of extremely precise optics that combine lens, grating, and a phase plate in one unit. The precision required is phenomenal, but I'm sure the military has had the technology for quite some time. The science was originally developed by the Officine Galileo, who have developed many of the instruments used on many NASA/ESA missions. "If it does fly, and it does work, then either my whole theory is blown, or the optics are something special. " I would disagree with that statement. The fact that, after all these years of space activity we don't have ANY photos of the Sun and the stars taken from space has already proven your theory. A single "proof" in the form of whatever project now based on simple trust ("we can't independently verify anything at this point) is not going to change this fact. In fact, we should have tens of thousands of excellent photos of the Sun taken from Space. Hundreds of thousands. Where are they? and if they are going to put a little Hubble up there for a million bucks, wouldn't you think that Nikon, or some other brand, would have put something out there by now as a very cost effective advertisement. "Nikon-Camera of the Stars!" or whatever. And the Sun will not be imaged, no neutral density filter on their wheel.